In July 2013, President Obama issued an Executive Order on Combating Wildlife Trafficking, recognizing the development and conservation threats outlined above and requiring a concerted United States response. Interagency and consultative processes that followed resulted in a National Strategy for Combating Wildlife Trafficking in February 2014, and subsequent Strategy Implementation Plan in February 2015, both organized according to objectives related to law enforcement, demand reduction, and international cooperation. A fact sheet describes some of the results achieved in the first year. The President’s Task Force on Combating Wildlife Trafficking, comprised of 17 federal agencies and offices co-chaired by the Departments of State, Justice, and the Interior, is responsible for developing, refining and mobilizing resources to implement the strategy. Strong technical leadership, long-term presence in range and consumer states, and management of the majority of USG funds going to international conservation efforts all make USAID a key member of the task force. In the U.S. Government, USAID is the largest funder of actions to combat wildlife trafficking internationally. Our portfolio is focused on Africa, Asia and the illegal trade between them. Work in Africa is often focused on preventing poaching in the first place, usually in partnership with local communities, and strengthening legal and judicial systems essential to holding wildlife criminals accountable and deterring further illegal activity. Work in Asia prioritizes detecting illegal wildlife products in marketplaces and ports of entry, and reducing demand for wild animals as food, medicine and status symbols: the root cause of the problem. Globally, we support analyses, international cooperation and capacity building needed by governments to disrupt illicit trade and dismantle organized crime and trafficking networks, and promote technology solutions that can amplify and sustain results. More information on USAID’s efforts is here, including fact sheets with examples of our major programs. USAID views technology as a “force multiplier” in the war on wildlife crime, with potential to scale the reach, impact and effectiveness of every intervention. From SMART law enforcement monitoring systems, to the WildScan app for detecting and reporting species caught in illegal trade, to powerful, practical genetic sampling tools that support investigation and prosecution, USAID’s support for technology is enhancing the work of people on the frontlines. Recognizing this, we are currently fostering new innovations through a Wildlife Crime Tech Challenge, sourcing science and technology-based solutions to detect transit routes, strengthen forensic evidence, reduce consumer demand, and tackle corruption. The Tech Challenge will award prizes to the most creative and promising solutions to wildlife crime, and put the winning innovations into the hands of individuals and institutions that can use them. More than 300 applications were received between April 22 and July 1. Expert judges will decide the winners, to be announced in fall 2015. 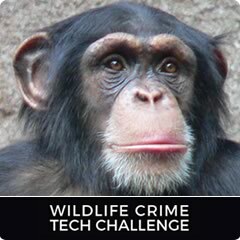 Visit the Wildlife Crime Tech Challenge website for more information or to subscribe to updates. New resources to improve how Combating Wildlife Trafficking programs are designed, selected, monitored and evaluated are enhancing USAID’s work and being made available for the wider public through this site. A key publication is Measuring Efforts to Combat Wildlife Crime, developed to guide government agencies, conservation organizations and donors in adopting or developing indicators useful for monitoring the effectiveness of their approaches. In consultation with experts from government, civil society and academia, USAID identified 10 major strategic approaches for combating wildlife crime, elaborated theories of change for each, and proposed indicators for the key results expected. The theories of change developed through this process are also useful to crafting and reviewing the validity of site-specific actions to counter poaching and wildlife trafficking. Compilations of indicators currently in use or recommended by experts – one from within the conservation community and another surveying those used by other sectors -- contributed to the USAID indicators guidance, and are now available. The guidance itself is forthcoming in fall 2015. These, and a space for collaboratively developing Reference Sheets for USAID’s recommended indicators, are available here. Measuring Efforts to Combat Wildlife Crime: A Toolkit for Action and Accountability. The "CWC Toolkit" was developed to guide government agencies, conservation organizations and donors in adopting or developing indicators useful for monitoring the effectiveness of their approaches. The theories of change developed through this process are also useful to crafting and reviewing the validity of site-specific actions to counter poaching and wildlife trafficking. This compilation of indicators current in use or recommended by experts in the conservation community contributed to CWC Toolkit development and may also be useful to CWC Toolkit users. A standard for USAID monitoring, these detailed guides provide precise definitions and recommend how to collect and calculate indicators for 13 key results in the CWC Toolkit.